A well-optioned single-cab Silverado, which you could still order new in 2018. I’m old enough to remember, barely, when a pickup truck’s default design was a two-door and crew cabs looked like freaks of nature. That will probably never be the case again. But as long as single cabs exist, they’ll always be the best-looking pickup trucks. The simple silhouette of a single cab pickup speaks to the old idea that trucks are utilitarian tools. I think it has something to do with the fact that cowboy toughness, which truck commercials are so fond of trying to invoke, tends to pair with a solitary existence. Something something Sam Elliott voice. And you don’t need a backseat when you’re out on the range by yourself all day, because your only family is your trusty dog and your giant hat. 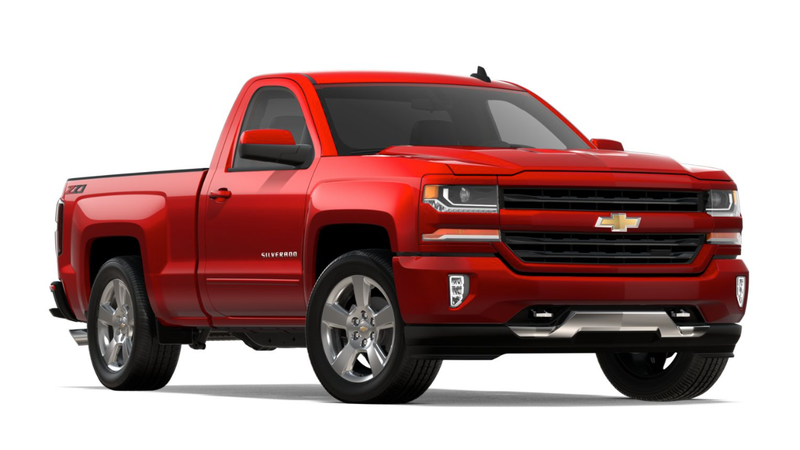 My brain fell into this rabbit hole as I walked by a two-door 2018 Chevy Silverado Z71 yesterday and lost my mind a little bit, realizing there were probably fewer trucks in that particular spec than there are Ferraris here in Los Angeles. Prior to that one, I couldn’t remember seeing a current-body-style Silverado Z71 single cab in the wild... ever. I couldn’t find any glossy press pictures, either. That image above is a screenshot from Chevrolet’s build-and-price site. It looks badass, by the way, doesn’t it? Now that pickups are successfully being sold to Americans as family cars and crew cabs seem about as common as Camrys, I think well-equipped single cab trucks have a stronger musk of toughness than a crew cab with enormous tires and two rows of light bars. Maybe I just like single cabs because so many of my favorite fantasy trucks only had two doors–like Marty McFly’s Toyota, Bigfoot and the flareside GMC from Supernatural. It might also have some to do with the fact that I just like versions of cars I don’t see very often. But single-cab trucks are only going to get cooler as they become less common, because the classic look is never going to go out of style. What Ever Happened To &apos;Flareside&apos; Truck Beds?